Let your pet help you celebrate World Environment Day on Sunday, June 5 by wearing an environmentally-conscious outfit from the Posh Puppy Boutique. Made from organic cotton, our Bark For Green tank shirt ($28) features a recycling logo modified to look slightly like a paw print. Profits from this shirt go to help environmental charities. Dress your dog up for cool nights with one of our 100% Bamboo Love sweaters (starting at $67). Soft and silky to the touch, Mochi & Jolie’s 100% Bamboo Knitwear Collection is made completely from bamboo leaves. The rapidly renewable plant is not killed when the leaves are harvested. The sweaters wear well while also providing natural antibacterial properties. These sweaters are also made in the USA. Your dog (up to 10 pounds) or cat (up to 12 pounds) can a great night’s sleep in our Pei Pod Bed ($195). The rounded egg-like shape is similar to a cave while also enhancing your living space with a bed that is both stylish and comfortable. It is available in ivory, mint and pink. The pEi pillow (in pink or yellow) is completely washable. Both the pillow and high density polyethylene enclosure are completely recyclable. Take some Scoopies Poppy Pick Up Bags ($4) along on your next walk. Not only will you help the environment by picking up poo, you’ll be using an item earning the “Staff Pick” from Modern Dog Magazine and a product mentioned in Bark Magazine, too. Keep your pet entertained with one of our new plush Crinkler Toys that contain a recycled water bottle. The crinkling sound of the replaceable bottles keeps you dog entertained for hours while keeping these bottles out of local landfills. Toy choices include: Cow Bottle Buddies, Pig Bottle Buddies, Dog Bottle Buddies and Sheep Bottle Buddies ($14 each). Your dog’s coat will shine—and repel fleas and ticks—when you bathe your pet with John Paul Pet’s Tea Tree Shampoo ($14). Using naturally-moisturizing Australian Tea Tree oil, the shampoo does not contain DEET, pyrethrins, synthetic pyrethroids or permethrins that can irritate your pet’s skin. These and many other environmentally-friendly pet products are available now at the Posh Puppy Boutique. Call 888-837-5230 with any questions. Scientists, medical professionals and cowboys have known for years that applying a cool cloth to your neck helps avoid heat-related problems. Now the same simple technology, but with an added calming effect, is available for your dog at the Posh Puppy Boutique. Our calming herbal bandanna ($32) is a gentle, safe, effective and stylish way to help your pet deal with the heat. Each bandanna contains a pouch filled with water-absorbing polymer crystals. The crystals take the heat from your dog’s neck and evaporate the water, keeping your pet cool and comfortable. These bandannas are available in sizes from double-extra-small to extra large so they fit breeds ranging from teacups (and cats) to Great Danes. With 15 colors to choose from, you can pick a calming herbal bandanna to match your pet’s outfit for the day. Just tie it around your pet’s neck and your dog or cat will have hours of comfort from the heat. In addition to providing heat relief, these bandannas are filled with lavender and chamomile. The herbal odors stimulate Alpha waves and decrease Beta waves. Your pet will be calmer and better able to handle the stress of both long walks and short car rides. We also add in balsam for additional aromatherapy benefits and a fresh, outdoorsy balance. As a special summer bonus, the Posh Puppy Boutique is adding a second herbal cooling pouch (a $5 value) at no extra charge. Visit us on-line or call 888-837-5230 with any questions. Your dog’s eyes can be permanently damaged by the sun, wind, rocks, bugs and all sorts of flying things. Protect their delicate orbs with a pair of ILS Doggles from the Posh Puppy Boutique. 1. Deeper lens cups to protect dogs’ protruding eyes and keeping the lenses from irritating your dog's eyes. 2. Wide nose bridges, since your pooch’s nose is so much larger than ours. 3. Foam padding around the entire frame, making Doggles comfortable for short trips and long hauls. 4. Soft, adjustable head and chin straps to keep your Doggles attached, even when going for car rides. Available in sizes from extra-small to large, Doggles also provide 100 percent protection from the sun’s ultraviolet rays, which can harm your dog’s eyes like they harm humans’. They are also shatterproof, providing additional protection. Best of all, Doggles ($25) come in several styles and colors such as Green Camo, Ice Blue, Shiny Pink, Black Flames, Lilac Flower and Silver Skulls. Just like top-quality human designer sunglasses, swim and ski goggles, ILS Doggles have interchangeable and replaceable lenses. This means you can adjust the lens colors to provide ideal protection, no matter the light. Additional lenses ($15) are available in black, blue gray and red. Give your dog the same quality of eye protection used by working K9 units, Border Patrol, Search and Rescue and other professional dogs: ILS Doggles. 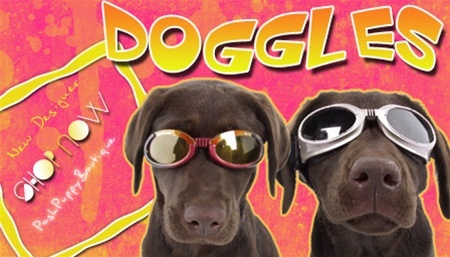 Another eye protection option available from the Posh Puppy boutique is Originalz—the Original Doggles ($20). Also available in sizes from extra-small to large, they come in three colors: black, blue and grey and have shatterproof, anti-fog lenses. Owners of tiny dogs can protect their pets’ eyes with K9 Optix Sunglasses designed just for dogs ($15). These stylish sunglasses in gold or pink have a rigid frame and soft, adjustable straps. 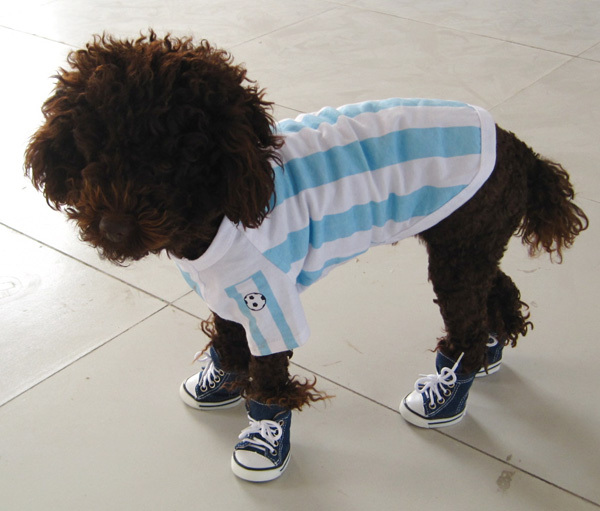 They are available in five sizes, including extra-extra-small for dogs weighing 1-4 pounds. For details and more information about the Posh Puppy Boutique’s extensive selection of dog eyewear, visit us online or call 888-837-5230. Every one is enthusiastically waiting for movie Beverly Hills Chihuahua 2, a sequel to Beverly Hills Chihuahua. The movie runs around dogs Chihuahua breed. It’s an adventure based comedy movie for the whole family. When you go through the story and the movie trailer you will find Chihuahua dog Papi and Chloe getting married in the first seen it self. And the best thing you will find in the particular seen will be the dogs wedding dress. The wedding dresses for these dogs are really cute. Papi wearing black wedding dog tuxedo and a bow tie that buttons on. And his bride Chloe wears a dog wedding gown with veil & leash. Little bride looks beautiful walking down, wearing elegant fully lined, white satin and lace Dog Bridal Gown Set. These dog couple Papi and Chloe looks great as a dressed bride and groom. The movie moves on and Papi and Chloe turn into Chihuahua parents. Faces a challenge to take care of rambunctious and mischievous puppies. Dresses designed for these puppies are also cute. In one of the seen you will find these 5 mischievous puppies dressed in color full shirred dog skirt. And there is no word for posh puppy ID tags which they are wearing. They are just best in the midst of other dog ID tags. The story makes a huge change when human owners of these Chihuahuas end up in trouble, and little pups stop at nothing to save their family. Papi, Chloe and the puppies embark on a heroic adventure by entering the Beverly Hills dog show. At this particular dog fashion show every dog looked great! Where these dogs are dressed into different dog costumes,like some dressed like a wicked witch, some dog wore cheerful hound dog costume and other wearing Bloomin' Snout Pet Costume and many more. For sure you will enjoy Beverly Hills Chihuahua 2, with dogs dressed into wonderful costume. Water, water everywhere … and your dog may be at risk. What is a pet owner to do? Let some products at the Posh Puppy Boutique help ease your mind. While dogs have an innate ability to swim—think dog paddle—that may not be enough to keep them safe, especially around water. Whether it’s flooding rivers, heavy downpours, going boating, a trip to the beach or the backyard pool, the Posh Puppy has life jackets designed just for dogs. · Reflective strips for added visibility day or night. · A nylon handle on top to carry and control your pooch. A D-ring for attaching your pet’s favorite leash, quick release buckles and Velcro belly straps are also part of the package. Similar dog life jackets are available in Blue Polka Dots ($35) and Pink Polka Dots ($35). All three are available in sizes from XXSmall to Large (prices vary by size). Water skiers and beachgoers may prefer this red Neoprene Doggy Life Vest ($45), which is very similar is style and color to that worn by many humans, including lifeguards. The Posh Puppy Boutique also an attention-grabbing boat flag ($20) with a white bone on blue background. This flag is perfect for letting other boaters know there is a dog in the water. Hunting dogs, especially those who like waterfowl, may prefer the subtle colors of this Camo Doggy Life Jacket ($49-$69 in sizes up to extra large for dogs weighing more than 90 pounds). Other options include the Pet-Saver Life Jacket ($38-$48) in neon orange for long-range visibility; the Fashion Aquatic Life Jacket ($30-$49 in sizes from teacup to extra large) in pink floral or blue floral for a fashion statement both on and off the water; and Fido Float ® in orange or yellow with a tail to collar zipper for easy on and off use. For these and other products designed to make your stay by the water less stressful, visit the Posh Puppy Boutique or call 888-837-5230. It’s been said that diamonds are a girl’s best friend. That girl does not need to be human. Ggirl dogs like diamonds, too. The plot of Disney's “Beverly Hills Chihuahua” (the Posh Puppy Boutique is an official Disney partner) revolves around a diamond-studded collar worn by a Chihuahua. When you want serious bling--like diamonds--for your favorite four-legged friend, look no farther than the Posh Puppy Boutique. We do not carry one diamond collar: we have nine starting with this La Jeune Tulip Diamond Dog Collar featuring a 1.52-carat marquis cut as its centerpiece (call us at 888-837-5230 for pricing). The large diamond is surrounded by a marquise-, pear- and brilliant-shaped diamonds, all handcrafted with extreme precision and supplied with Gemology Institute of America certificates for most stones. Eight other diamond collars are also available in champagne, blue, brown, natural, green, orange, red and lavender ($3,000 each). All start with snakeskin or other exotic materials then add silver topped by jeweled accents. They feature round white diamonds in a riveted line and are feather edged with 15 round white diamonds on a buckle and loop of sterling silver. Each collar has 1.2 carats of diamonds. Instead of a collar, consider a WOOF Sterling Silver Necklace with white and black diamonds ($475). The Posh Puppy Boutique also carries several unique diamond-studded dog pendants. They include these 18k Bezel Bone models ($1,900), available in white or yellow gold; our Diamond 18k Pave Bone Pendants ($2,600) from Ellie Rocks NYC’s Couture Collection; this Diamond 18k Chihuahua Pendant ($2,700) with a pink or blue sapphire collar; and this Dog and X Bones XL Pendant (also in white or yellow gold) for $4,500. The Dog and X Bones pendant features white diamonds, black onyx and a pink sapphire. Several other choices are also available. In addition to diamond collars and pendants for pets, we carry diamond products for dog lovers. They include these bone-shaped earring studs ($1,200) and these black onyx paw cufflinks ($5,800) too! The Posh Puppy Boutique carries many other “bling” collars, like this “fancy diamonds” rhinestone version ($46), which is available in several colors and stone colors. If dresses are more your dog's style, consider this one modeled after one worn by Marilyn Monroe in "Diamonds Are A Girl's Best Friend." For these and many other dog and cat items showcasing your taste and style, visit the Posh Puppy Boutique or call 888-837-5230. The Eco Friendly dog bags are fashionable and graceful, yet so friendly to our environment. And the right mix of fashion and eco friendly elements prompts people to purchase them. These environmentally friendly shopping dog bags are great for getting groceries, running errands, or carrying your best friend's toys to and from the park. These tote bags can be found online. Available is various shapes and sizes. If the brands Juicy Couture, Oscar Newman, Poochie of Beverly Hills, Susan Lanci, Toni Mari, Lady B. Couture, Juny Bell, Disongbeni and Pinkaholic New York ring a bell, then you are familiar with some of the designers now making items for pets. Yes, these designers have literally gone to the dogs—and in some cases, cats—in their pursuit of pawed perfection. For example, where can you find this Juicy Couture Polo Dog Shirt ($40) in vivid pink, complete with a signature logo patch making it perfect for the pampered preppy puppy? At the Posh Puppy Boutique of course. Girl dogs seeking to go walking in style may prefer this Juicy Couture Ruffle Party Dress ($55). Don’t fret if Oscar Newman is more your style. The Posh Puppy has your pet covered—literally—with many products to pick from. One example perfect for the warm weather is this Sweet Lemonade Smocked Dress ($48) with hand-sewn flowers, pastel smocked bodice, ruffle hem and other touches. Your little angel might prefer instead this Angelica Hand-Smocked Dress ($73) with pearls and sequins. From Poochi of Beverly Hills comes an array of designer dog beds. Your choices start with this Hollywood Leopard Bed ($1,200) that appeared in the pages of Vogue. It has platinum lustered faux leather with alder legs and supports dogs up to 25 pounds. Susan Lanci designs many different types of pet accessories. One of them is this Faux Suede Sling Carrier in Fawn Pink ($80). It lets you take your pet anywhere in comfort and style while keeping your hands free. Among the other sling choices is this sport model ($60), available in four colors. Boy dogs—girls, too—can get into the swing of Spring Formals by wearing this Black Dotted Formal Vest ($55) in wine and black from designer Toni Mari. Lady B. Couture has several exquisite dog dresses to pick from such as this Bubblegum model ($180). A matching leash (450), collar ($40) and hairbow ($20) are also available. Juny Bell designs created this Blueberry Hill Jumper ($105) with cream ivory colored soft cotton plus lace and a wood button, making it perfect for wearing inside and out. Give your dog a touch of elegance with this Barefoot Contessa Dress ($195) made with lots of lace, white pearl decorated bows on the chest and shoulder plus matching bonnet, all from Disongbeni. Your dog will surely capture plenty of attention when she walks down the street wearing this Selena Shirt in pink ($36, also available in aqua) from Pinkaholic New York. These are only a few of the many designers carried by the Posh Puppy Boutique. Check us out online or call 888-837-5230 to see more. Dog Collars, a most important thing you need when you have a dog at home. It helps you to keep your dog under control. A collar might also be used for identification, fashion, or to satisfy other purposes. Dog Collars are often used in combination with a leash, and a common alternative to a dog collar is a dog harness. Dog collars are the most common form of directing and teaching dogs. Dog collars are not as simple as they seem. There are many different types of dog collars available in the market to suit different functions and needs. Buckle collars are meant to fasten your doggie. And are mostly made up of nylon, cotton, or leather. Quick release collars are adjustable dog collars which can be easily put on and taken off quickly. A quick-release collars are meant to help the dog pull itself free, if the need be. Slip collars can be tightened and loosened with pressure from the lead. And there are many such like Tutu Collars, Swarovski Crystals Collars, Head Halters and Harnesses. Nothing screams style and fashion like a good pair of shoes. Consider treating your favorite four-legged friend, showing her or his good taste—and yours—with a set of dog shoes or sandals from the Posh Puppy Boutique. From formal to stylish casual to athletic, the Posh Puppy has shoes designed to showcase and protect your dog’s feet. Jet back to the 50’s with these saddle shoes ($50) in pink or red. Designed for girl puppies, they have non-slip soft soles and front laces. Available in four sizes depending on your dog’s paws, they provide comfort, traction and style, especially at training classes. Toto may not be in Kansas anymore but your dog can emulate Dorothy from “The Wizard of Oz” when she goes out in these Red Glitter Shoes($50) complete with red bows. Complete with adjustable ankle straps and soft, flexible stockings, they not only protect your pup’s feet from heat and cold, they look great, too. When heading out shopping, consider bringing your favorite doggie friend along. Dress her in these pink camouflage sneakers ($55-$59) with light rose crystals and her hipness will be apparent to everyone who sees her. Swarovski crystals on the front pair will give her that sassy and classy look. They are also available in navy and red. Outdoor-minded dogs might like the patented soles and angles in our EPIKS ™ dog shoes ($68-$72). Unlike other dog shoes, the EPIKS—available in black, blue, brown, pink and red—have different pairs for your dog’s front and back feet. Each pair rolls their paws, resulting in a more comfortable stride. In addition to dog shoes, the Posh Puppy Boutique also carries sandals designed just for dogs. We have got a special sale going on right now: our Pink Mesh Dog Sandals, normally $27, are on sale for $13. They have adjustable Velcro ankle straps and breathable mesh for added comfort and style. Let your dog’s feminine side stand out from the crowd by dressing her in these pink sandals ($55) that come in four sizes (also available inchocolate brown). They let your dog’s feet breathe while protecting them from hot surfaces, such as sand and concrete, stickers and other nasties lying on the ground. Go green with these stylish and practical Meadow Green Air Doggy Sandals ($48-$50) with hard rubber soles to save their pads from hot sand and concrete while side cutouts keep their paws cool and comfortable. These sandals are also available in pink, red and spice. For these and other treats for your dog’s feet, visit the Posh Puppy Boutique or call 888-837-5230. Honor a military veteran and active duty service personnel this Memorial Day by dressing your dog in patriotic clothing and accessories from thePosh Puppy Boutique. Start with a red, white and blue USA 100% American Pure Bred Bandana ($19), made with lightweight canvas. It has two rows of American flag trim and an embroidered white USA. At the Posh Puppy Boutique, we also have a patriotic bandana modeled after the American Flag ($10). Showing homage to those brave men and women who gave their lives in the service of our country, the Posh Puppy Boutique sells Fallen Angels Pet Wings ($38). The wings from designer Pets Fly are available in six colors: red, white, blue, pink, gold and black. For something even more stylish, consider any of our many patriotic collars, all featuring bows. Girl dogs will love this Red Polka Dots Bow($30) collar featuring three bows. Boys wanting to be dressed to the nines will enjoy this blue collar with one large red, white and blue bow ($30). Show your political party preference by adding a dog ID tag to their patriotic collar. We have tags featuring the Democratic Donkey ($18) and the Republican Elephant ($18). Take your petite patriotic pooch to a service honoring servicemen and women using this Starstruck II Carrier ($85). The starts and stripes cotton bodice has navy blue trim and long, adjustable poly straps. Show veterans you served by equipping your dog with this Vet Flag Patch Dog Tank Top ($30), available in 12 colors including green camouflage. The dog shirt features an embroidered American flag with “Vet” in black overlaying it. Dog owners wanting to honor our current President can put their girl dog in a patriotic America Obama Dress ($40) from Central Bark Couture. This a 100-percent cotton layered skirt featuring President Obama and an American flag motif. When heading to a barbecue after a Memorial Day service, consider the Bark Obama Tee Shirt ($25) with a silkscreened red, white and blue logo with a red paw print in the center. For these and other ways for your dog to honor veterans on Memorial Day, visit the Posh Puppy Boutique or call 888-837-5230. VIP Pre-Summer Sale 25% off your ORDER! Stock up today and save! Hurry Sale ends Sunday, May 15th! 25% Pre-Summer Sale at Posh Puppy Boutique!